What is CTE..Chronic Traumatic Encephalopathy…? CTE has been in the news lately, but many don’t understand exactly what the condition is, or what it does. CTE is atrophy of the cerebral hemispheres, medial temporal lobe, thalamic, mammillary bodies, and brainstem, with ventricular dilatation and fenestrated cavum septum pellucidum. These changes occur during traumatic injuries to the brain resulting in neuronal death. This neuronal death is a result from direct physical damage. This complex process involves both necrotic and apoptotic death cascades. When these areas of the brain undergo changes, the following symptoms appear: changes in memory and cognitive functions, behavioral and personality changes, abnormalities in gait, parkinsonism, and speech disturbances. 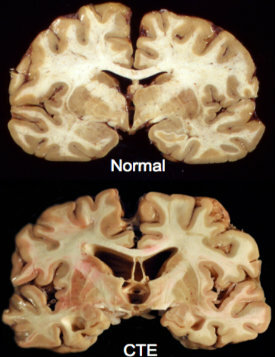 Notice the image of a normal brain, directly underneath is a CTE brain, notice the hollow appearance in the CTE brain. The tissue has atrophied.